Hatco is a leader in foodservice equipment manufacturing, combining steady innovation with the determination to increase equipment efficiency and performance so that your foodservice business can succeed. With many types of food warming and countertop cooking equipment, including such mainstays as fry stations and conveyor toasters to hot food wells, heating lamps, drawer warmers and heated display cases, Hatco can provide solutions that are ideal for catering or concession businesses as well as many other types of commercial kitchen environment. 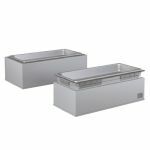 Quality salamander broilers can finish off those toasty sandwiches and durable proofing cabinets can keep and hold breads, rolls, fried foods, steamed veggies and more until you are ready to serve them. A piece of Hatco equipment is an investment in the future of your business.